Ogryn by the magnificent Mark Gibbons. 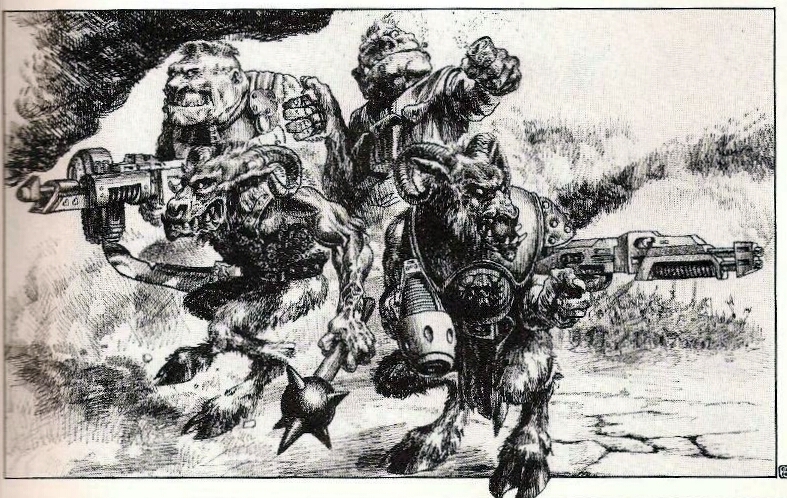 Warhammer 40,000 started out as classic fantasy species, in spaaaace. Lord of the Rings of Saturn was the working title until scant weeks before Rogue Trader was printed in fact*. Some species were integrated into the setting well, while others felt like someone had simply handed a character from Hawk the Slayer a laser gun. I liked this in some instances and not so much in others. 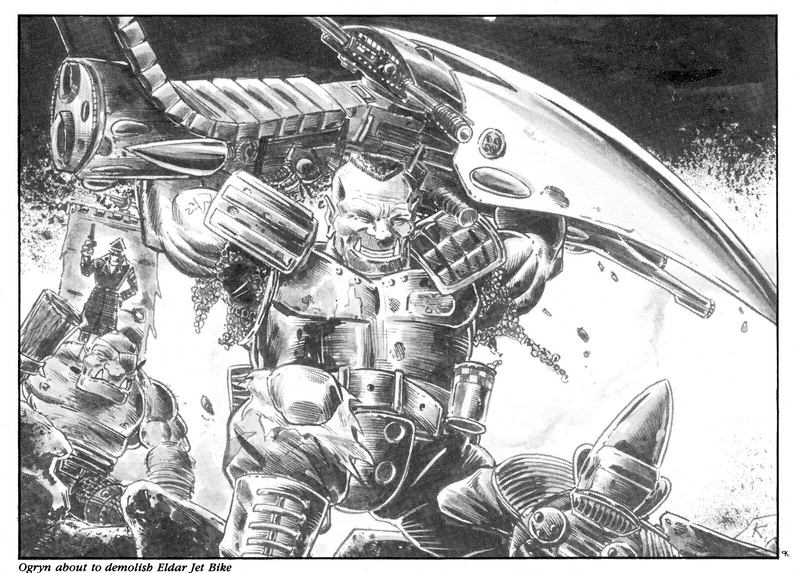 A ogryn waving a jetbike around by the peachy Pete Knifton. Ogryns can grab jetcycles as they fly past and then play whack-a-biker using the vehicle in place of a hammer. In a game about fighting, this is excitingly OTT fighting. Possibly equalled since, but yet to be topped. Before I knew who Bob Olley was, I knew his distinctive sculpting style. It came together on these ogryns definitively. Absolutely iconic. 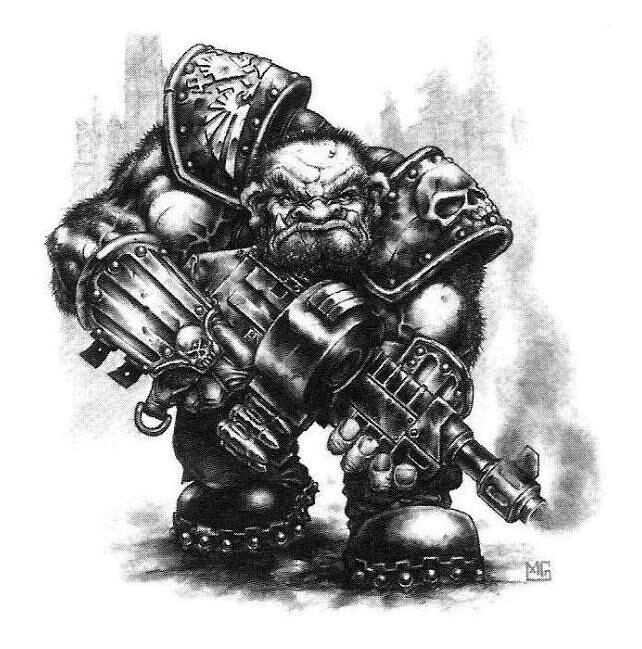 Originally limited to Imperial “BONEhead” (Biochemical Ogryn Neural Enhancement) ogryn squad leaders, the ripper gun description as a cross between a giant tommy-gun and an oversized, metal, baseball bat stuck with me. The weapon is as uncomplicated as the vaguely lovable ogryns themselves. One of my very favourite Warhammer 40,000 illustrations ever, by the pan-galactic Paul Bonner. The combination of 20th century military tropes with fantasy species has rarely been as irresistible as it is in the image above. One of my favourite 40k illustrations of all time. It has ogryns in it. So I like ogryns. After picking up Chompers from Just John in 2015, I recently felt an urge to paint the figure in anticipation of an upcoming game of Dinoproof. Click on the image to be taken to the Dinoproof site. Dinoproof is a game about reality TV stars hunting dinosaurs for celebrity status, cash and endorsements. Its set in a dinopocalyptic Earth, but as soon as I heard about it I fancied setting it on an Imperial fringe world, making more varied “Dino Slayer” models fit in. Chompers is the one that I have decide to pin my flag to for now. Khaki is a classic safari colour, so I figured that would be a fun approach. 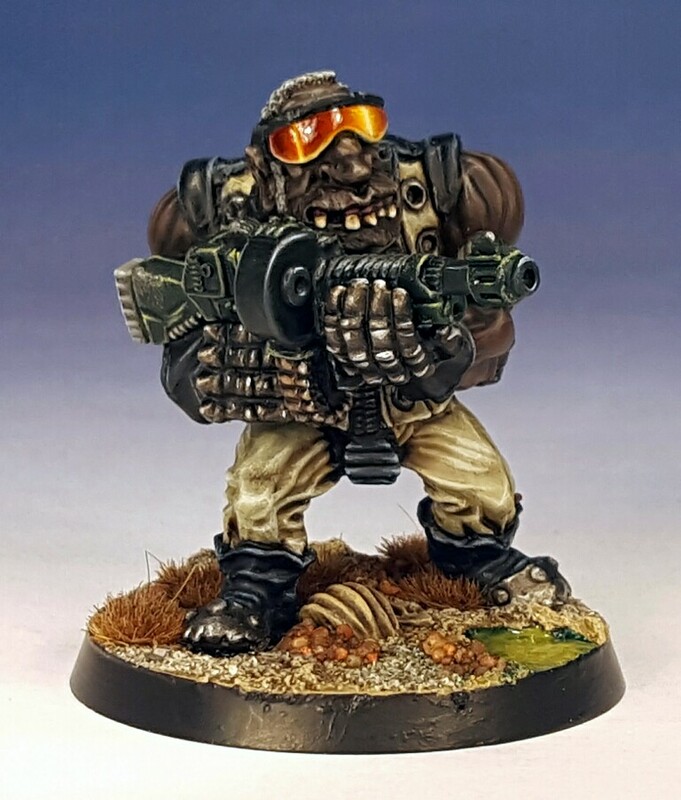 I dont recall seeing an ogryn in khaki before. I decided to try a dark skin tone largely based on this tutorial. I went with a military green finish on the weapon, to keep a vaguely plausible vibe and then blew all notions of that away with a massive set of bright orange shades (tapping the very skilled Curis for guidance). Overall I am quite pleased with how Chompers has turned out. Im looking forward to seeing how he performs on camera when headbutting a charging pachycephalosaurus. Im certain that he will bring his own brand of problem solving to the entourage of Inquisitor Verhoeven not long afterwards. Some missions require a light touch, precision and subtlety. Some dont. I love your write-ups, and Chompers looks exactly as he should. Those shades are brilliant! I enjoy the write ups to be honest. Its hard to know if they are just going to be indulgent blah-blah or actually provide value. But they help me get my head around things. Im glad that you got something out of it. Those glasses are marvellous. Truly top notch painting! I made a little bit of extra effort with those. It paid off nicely. Yes, the goggles and the teeth are my favourite parts. There’s a lot to like in this seemingly uncomplicated figure. It was a nice model to paint too. Very caricatured, almost to a 15mm level in some respects. That doesnt always make a model more fun to paint, but this one certainly was. Brilliant, in particular the glasses are quite literally so. I didnt paint the shades until last. I had a fair idea that the orange would look good, but I wasnt sure how the glare etc would work out. But it all came together nicely in the end! A welcome return to SciFi with a classic miniature, beautifully painted. Those shades…I’m speechless!! High praise indeed Axiom, thanks. Fantasy is only ever a fling for me. Science fiction/fantasy on the other hand is my bread and butter. After not painting any sci-fi for a year its really interesting to go back to it, see what I missed, see what I didnt etc. Im glad that you approve of Chompers. Superb fresh take on a classic. Loving the homage to the great illustrators that shaped the galaxy. I try not to put too much unnecessary waffle in these posts, but sometimes its relevant. I think that its relevant here and that a certain portion of the audience will appreciate it. And thats twelve points from the French jury, thank you Grenoble. I knew I got you hooked on Eurovision. Hooked on Eurovision he says… we live in a post truth era. It’s an alternative fact, like your Johnny Logan worship. Linda Martin vs Johnny Logan is like Xbox vs Playstation around here. So it’s been going on for a good long while? In that case…what’s another year. Ripper guns and Bob Olley . . . .I’m sold!! Some combos are that good. 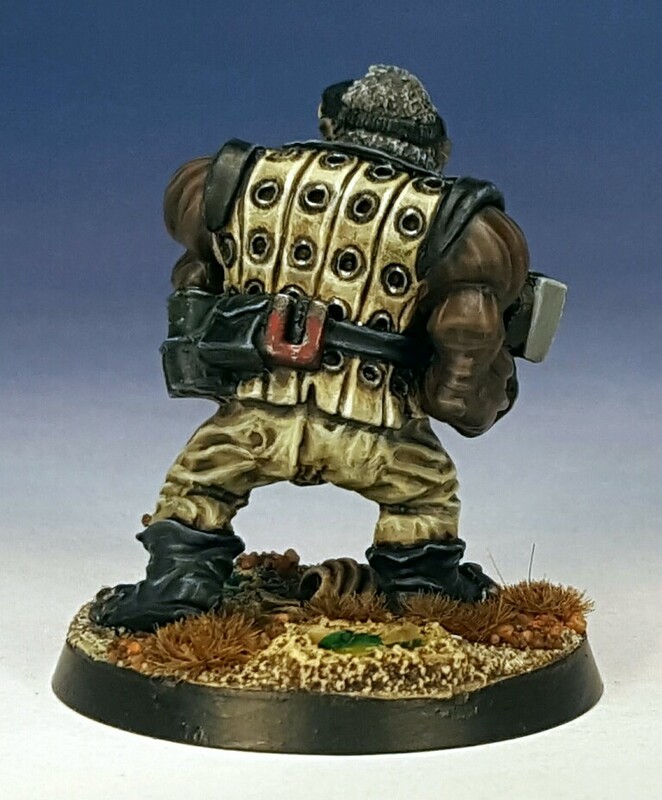 Hehe – I do love me an Olley Ogryn, and this guy literally rocks! Love those shades in particular, and nice job on the skin tone. Im glad that you mentioned the skin Alex, as the shades are getting most of the attention. Im really pleased with the dark skin tone, it looks a bit better than the last time that I tried to paint it. Skrog sounds worthy of reincarnation. These old sculpts are fun. Wow, man. Top notch. The colour combo (The skin!). The glasses! Gak, everything here looks so great! This is one of my more successful paint jobs I think Suber, so I am glad that a connoisseur of toy soldiers like you appreciates it. You have to love those old Ogryns. One of my proudest moments was realizing I’d sculpted myself a plausible Olley-style ripper gun for a conversion I’d been working on. You’ve done that one justice. And the shades . . . very nice touch. 🙂 I don’t doubt he’ll prove an irreplaceable addition to Verhoeven’s force. I enjoy a few of the ogryn sculpts since the iconic Olleys. I reckon that the modern plastics are ok and that the metal versions that were available before that are the next best variety. I dont particularly like the 90s (Perry?) versions. No question that the Olleys are my favourite though. Verhoeven has been searching for some suitable muscle for a while now. Im looking forward to seeing what sort of personality Chompers develops as games progress. Be careful. It turns out that one is only enough to whet the palette. Im glad that you liked the background discussion imperialrebelork. Verhoeven took a back seat for most of 2016, due to my dalliance with fantasy projects Will. I did miss the cantankerous ol’ nazi-buster though. Im certain that he will make a few more appearances in 2017. I should be putting Chompers through his paces during the week with a bit of luck. If I do then I will post up some photos. Im glad the like the big lug Captain. Chompers will hit a gaming table near you at some point, Im sure of it. Lord of the Rings of Saturn sounds like a musical. On ice. Rings of ice. You sure do pick some great model’s Paul & really bring them to life, the game sounds very interesting & I’ll be following along to see how it turns out. Thats nice of you to say Frank, thanks. Im a Bob Olley fan and his ogryns are pretty definitive examples of his work. This model was a pleasure to paint really. Dinoproof is a simple ruleset aimed at multiplayer games. Im hopeful that it will generate a few laughs. Sweet stuff in general, but those sun glasses are especially well-painted. Good job! I look forward to reading about the big chap swinging around on a T-Rex’s scrotum in due course. Dino gonad related shenanigans are more or less a given Argentbadger, although who knows? Its possible that Chompers may bite off more than he can chew. Stupendous work on those shades! I have this guy, and a few others kicking around in a box, and since I painted them approximately 19 years ago, they are quite dire. This makes me think I should pull them out and repaint them, rather than ignore them as I have been doing. Thanks, I’m glad that you like Chompers. 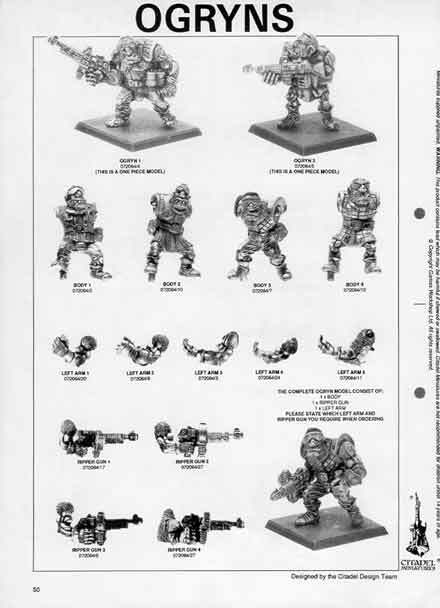 Im definitely drawn by the no nonsense, no frills approach that Ogryns have, in addition to the lovely models. 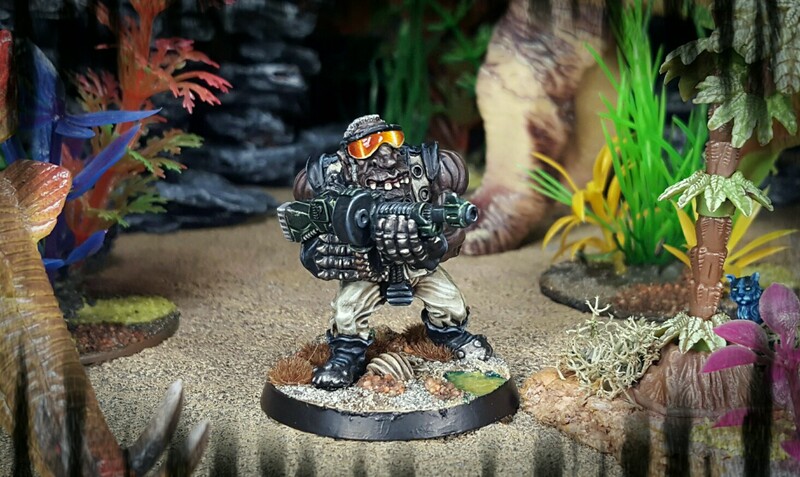 Lasgunpacker is hooking me up with a few to make a Cadian unit of them in fact, which will certainly be a bucket list item to complete. Awesome stuff. I certainly look forward to seeing them here once done! Because Everything is Awesome when it comes to Ogryns!